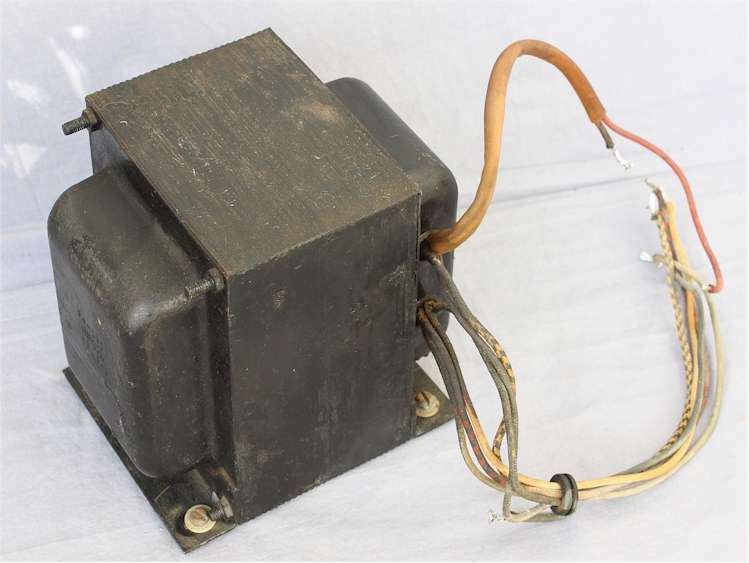 The first challenge when looking for replacement parts was finding the right high voltage transformer that not only is the right size to fit the chassis, but having the right voltage and current capabilities. I searched several sources for a compatible high voltage transformer and settled on the transformer from a Heathkit SB-220 Amplifier. The transformer seemed to be a good fit, it does produce a little more high voltage, and it is a bit smaller than the transformer in the original L4PS power supply. It has the dual 110VAC primary windings to operate at 110 or 220VAC and has tapped secondary high voltage windings for the "Tune" and "Operate" Modes. As shown in the picture below I mounted the transformer along the back of the chassis as close to the filament transformer as practical. I did this so I had maximum space to mount the power supply board on the opposite side and to allow for good air flow for cooling. The aluminum plate I installed earlier provided a solid mounting surface for the transformer. I ran the primary winding under the chassis in the back corner and the high voltage secondary winding were left above the chassis to connect with the power supply circuit board. I also mounted the plate choke to the left of the transformer to give me the proper distance to reach the tube and prevent arcing to the transformer. Under the chassis, shown below, I brought the both primary windings to a terminal strip so it could easily be wired to operate at 110 or 220 volts. Each primary winding is a tapped winding which is used to switch between the the "Tune" and "Operate" modes. Since that switching is the same for either the 110 or 220 volt operating voltage I used a small relay to do that switching. This way I eliminate the vulnerability of the power switch contacts from arcing internally and welding together due to the high current being switched. This is a very common problem in that power switch which prevents it from switching between the "Tune" and "Operate" mode. The photo on the left shows the transformer primary wiring to the terminal strip. From left to right the two primary winding are in groups of three wires In each group the black dual color stripped wire is the tapped connection to the winding. In the picture on the right shows the wiring for 220 VAC operation. The relay switches the winding tap connections for the "Tune" or "Operate" mode. The difference being lower high voltage for amplifier tune-up purposes. Power output between "Tune" to "Operate" is approximately 150 watts of additional power. The relay now operates from the front panel "Tune / SSB" switch to the low voltage power supply. 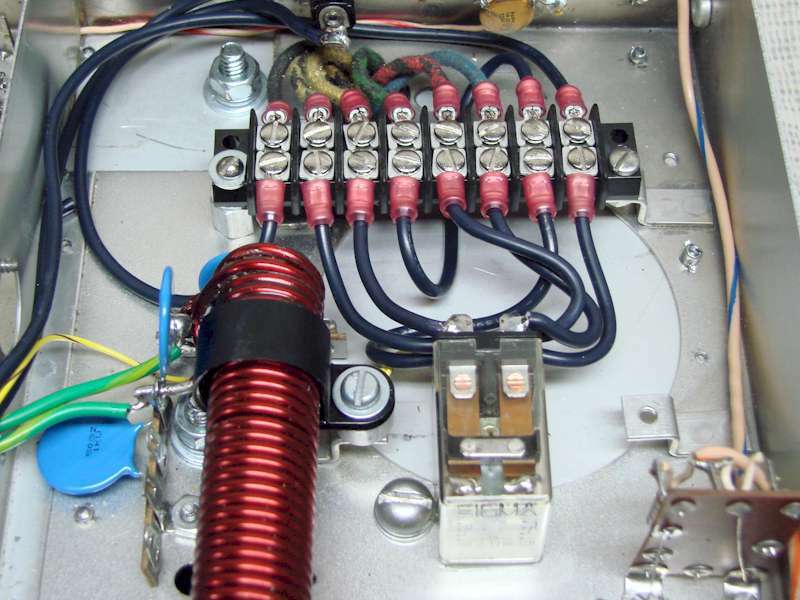 This eliminates the common problem of the front panel power switch arcing and welding the switch contacts together. The large 8 pin connector on back of the L4B chassis, originally connected to the L4PS power supply is now the primary power connector for the new design. The connector, depending on how the amplifier is jumpered internally, will except either a 110VAC / 220VAC input. 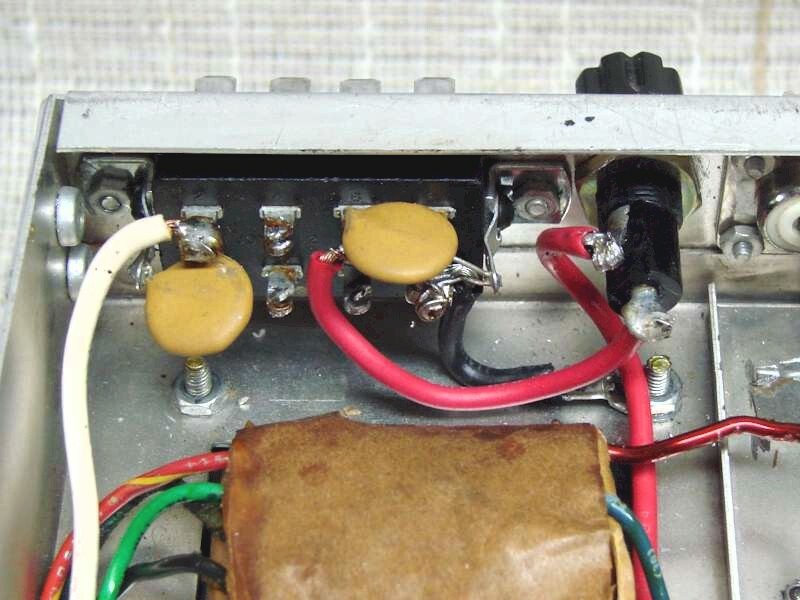 The circuit breaker protection for the amplifier was originally in the L4PS power supply. In my design there is very little rear chassis space to accommodate circuit breakers so I decided to use fuse holders. Since there are now two transformers each receiving primary power, I decided to install a separate fuse holder for each one. 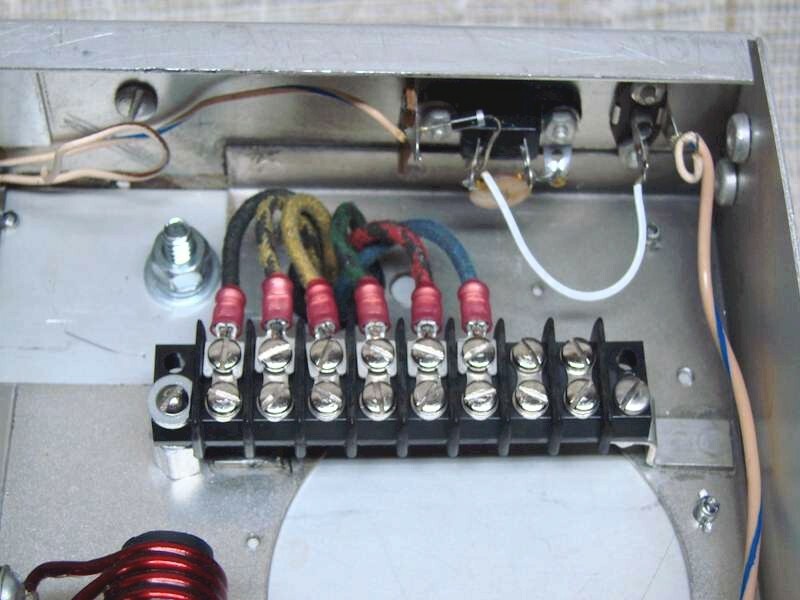 Shown in the picture to the left next to the 8 pin power connector is the chassis mounted fuse holder for the filament transformer. The high voltage transformer fuse holder is the same type fuse holder but mounted on the other end of the chassis near the high voltage transformer. Both fuse holders use a 15 AMP fuse for 110VAC or 10 AMP fuse for 220VAC.